When I was in eighth grade, I was madly in love. But the girl, who I wanted to marry and sometimes wrote sad poems about, didn’t feel the same way. So I decided to prove my love with a mixtape. For me, music was (and still is) the most intense force in the world, so I thought this would truly make her reciprocate my affection. I set my plan in motion by stealing my oldest brother’s Motley Crue cassette, putting pieces of tape over those tiny holes so I could record over the screeching of Vince Neil, and adding songs to my mixtape that would show just how great I was. I gave the tape to the girl the next day. A few days later, she told me that it was “cool,” but somehow it didn’t sway her romantic opinion of me. It might have had something to do with one too many Metallica songs, which were moving to me, but somehow not to her. But at the time, having her tell me that the mixtape was cool was a victory in and of itself. The mixtape is a powerful thing. As a kid, they were a way to show how much you cared about someone. For others, like those in hip-hop, the mixtape is a way to get their music to the people who crave it. It’s not an album; it’s much more personal. Though the mixtape hasn’t been a “tape” for many years now, the idea — that this highly personal collection of songs can move minds — remains the same. Skyzoo, a 28-year-old emcee hailing from Bed-Stuy, is a mixtape genius. You might remember him from battling Jin on 106th & Park’s Freestyle Friday (and if you do, you know he was robbed), but since then he has carved a career out of putting excellent mixtapes out, in addition to one major label album. His latest, The Great Debater, released just last week. Much like his previous efforts, it’s a brilliant collection of tracks that show hip-hop in its purest form. Because he’s a master of the medium, and because he came up as physical tapes disappeared and hip-hop blogs emerged, I asked him some questions about mixtapes and how they shaped him as an emcee. Artists like Grandmaster Flash and Kool Herc began experimenting with mixtapes in the 1970s. A lot has changed since then, but what do you see as the biggest change in how mixtapes are presented? The biggest change is obviously the way mixtapes are received. They went from cassettes and CDs that you paid $5-$10 for, to logging on to your computer or iPhone or iPad and downloading them for free via a plethora of blogs, music sites and social networks. A big piece of the expenses to make a mixtape has been taken out, and the option of getting your mixtape literally around the world is now a reality. How did you perceive mixtapes when you were growing up? Were they a hot commodity in Bed-Stuy? If so, which tapes were getting the most play? Mixtapes were a way of life when I was growing up. It was all about who had the newest tape, and that one tape ran the city for about a month, month and a half, until the next tape came out. When I was a kid, there were a bunch of big DJs putting out tapes, but the one DJ, hands down, was DJ Clue. When a Clue tape came out, everything stopped. The race was to be the first one in your neighborhood or school with the newest Clue tape, thus giving you access to the newest LOX freestyles, or Jay-Z remix or Nas record, before anyone else who hadn’t gotten to the mixtape spot yet to buy their own copy. Emcees often say that mixtapes are a way of keeping the hype going in between albums. Do you ever worry that your mixtapes will be better than your albums? Does it matter if they are? I personally don’t worry about that, because I know how to make a mixtape and an album, where they both do what they’re supposed to do. To me, a mixtape is more free spirited, more “shock and awe” inducing, as far as witty lyrics and punchlines. In today’s day and age, mixtapes are now spawning radio singles and videos, so you’re more aware of that reality and you keep that in mind when recording. But the general idea of a mixtape is to just keep it open and have fun. An album is where your themes, story lines, concepts, song writing, singles, etc. all go. The only artists who make mixtapes better than their albums are the ones who haven’t grasped the idea of what a complete album should sound and feel like. Song writing is key. Mixtapes typically feature beats that have been used before, but The Great Debater doesn’t; it’s all original production. Why did you decide to go that route? Well, throughout history, mixtapes have been built around other artists’ instrumentals, but I’d say since about 2009, 90% of the mixtapes that are released are all original music. The only thing that separates mixtapes from albums nowadays is that mixtapes are free and albums are $9.99 and up. Music has gotten so fickle now, and there’s so much of it being released so rapidly, you have to offer your fans more. They aren’t satisfied with you rapping over other people’s beats that they already have in their iPods. They want your mixtape to be great and your album to be greater, with the material all being 100% new. You’ve penned a few critically acclaimed mixtapes and an album, where do you place The Great Debater in your discography? The Great Debater is definitely amongst the top of my ranks as far as what I feel are my best pieces of work. I don’t like to compare my mixtapes to my albums because they have different goals, so to me its not fair. But if you look at all of my mixtapes, it’s easily the best one, hands down. It features a picture of the Cosbys on the cover. Why? The theme of the project is loosely based around the Huxtable family. The idea is that, to me, growing up, I always thought the Huxtable family represented winning. To have a beautiful wife, huge home that you owned, dope kids, doctor and lawyer money, Park Slope Brooklyn, to me, that was winning. I strived for that as a kid and pictured me in those sweaters and in that household. So essentially, the tape is all about winning. Success, and all that it takes to get there via this twisted music game. Do you approach an album differently than a mixtape? Definitely. I save all of my more deep, story telling and concept driven emotions for my albums. I’d never put “For What It’s Worth” or “Like A Marathon” or “Under Pressure” on a mixtape, which is why they went on The Salvation [his major label debut]. And I’d never put “Rap Like Me” or any of those types of records on an album, which is why that type of material is on The Great Debater. They’re all incredible records, but each has its purpose. Hip-hop blogs like Nah Right and others have definitely impacted mixtapes and the way “underground” emcees like yourself are heard. Would you say their proliferation has helped or hurt the game? I’d say it’s definitely helped. To be able to get your music all over the country, and then all over the world, via a website, is incredible. When I started out, the blogs were in their beginning stages, so it was still about going to the mixtape spots, sneaker stores, mom and pop record stores, etc, and getting your tape in there. I traveled all around NY, Philly, Boston, Connecticut, Virginia, D.C., Baltimore and beyond, physically putting my tapes in stores. Now I just send out an email and it’s all over the blogs in five minutes. If you had to pick one track from The Great Debater to play for someone who typically doesn’t listen to hip-hop, which would it be and why? If I had to choose one, which would be tough, it’d be “The Definitive Prayer.” On that song, I just rapped and rapped and rapped some more. There’s no hook, no added effects or sounds to mesh with other genres; just straight beats and raps. When I wrote that record, I just did everything I felt when I heard the beat. The horns, the drum rolls, the keys, it all screamed “hunger,” so I expressed that lyrically. Hip-hop started out as a way to express angst and hunger, and I’m not into staying in the past at all, but if someone has never heard hip-hop before, I’d suggest that they start there. Chris O’Shea is a writer living in Brooklyn. He once saw Nelson in concert. 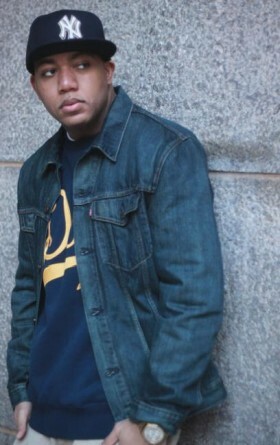 Photo of Skyzoo by Mookie X. 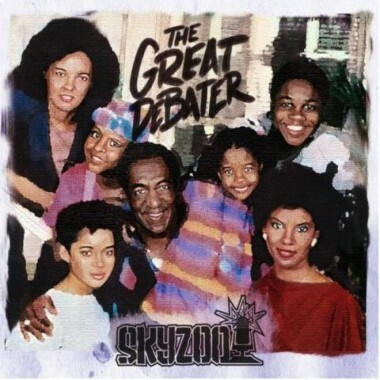 Photo of The Great Debater by Skyzoo.